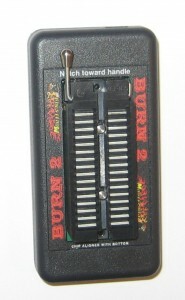 The Burn2 has the same features as the Burn1, only smaller and more compact. The Burn2 is a revolutionary device that was designed with the automotive enthusiast in mind. it supports chips used in our products aimed at ECUs/ECMs from the late 80s and early 90s. WRITE SST 27SF512, ATMEL AT29C256 and 29F040 chips. READ but NOT WRITE 2732A, 27C128, 27C256 chips (and most other 24/28 pin EPROMs/EEPROMs that can replace one of these chips). With a F2A adapter, it can WRITE our F3 EECIV/EECV chip modules. With a F2E adapter, READ factory Ford ECMs. with a HDR1 adapter, READ factory GM TPI ECMs that would use a G1 chip adapter . As you can see, it is designed to comprehensively work with our products but it is NOT a general purpose EPROM programmer. If you require programming chips outside these specifications, you probably should look at another product. This device can be used directly from TunerPro RT, EEC Editor, Binary Editor software packages as well as the Flash-n-Burn dedicated programmer software. Chris Handwerker was kind enough to write a utility for using the BURN2 under Linux. Thanks for sharing with us!